The Anglican Church has been working towards reconciliation for a long time and in BC, that work is being guided by Bishop Logan McMenamie, who is in turn, guided by Kwakwaka’wakw Elder Alex Nelson. Bishop McMenamie took the time to speak with us about the steps the church is taking towards reconciliation. It’s a very sad part of our history. As a national church, and in this diocese, there is a real commitment for us to move ahead, and to walk with First Nations as they regain who they are. Has your diocese accepted the need to acknowledge that past and work towards reconciliation? Wherever I am in the diocese I begin by saying “we are on traditional First Nations land and we give thanks for their hospitality” and I get the usual letters disagreeing with that statement. But, overwhelmingly the majority of the parishioners have moved from “what can we do to help the survivors?” to “how can we walk with First Nations people and learn from them?” Acknowledging the traditional lands has become part of our culture. A residential school survivor spoke of his experiences to about two hundred parishioners at a synod in Nanaimo. As he was speaking, people began standing up and by the end of his talk the majority of people were standing in solidarity with him; it was very powerful. When our new Dean was inducted, rather than have the Royal Anthem accompany her, Alex Nelson’s family drummed her in. And when I became Dean of the cathedral, I chose to be drummed and sung in rather than have the Royal Anthem. When First Peoples share their culture in our big house, they make us a better people and a better church because they open their hearts to us and we open our hearts to them. How do you help your parishioners work towards reconciliation? I draw upon the wisdom and guidance of Alex Nelson, a Kwakwaka’wakw Elder, and others as we move ahead as a Church. Every parish in the diocese, either verbally or in their bulletin, recognizes the traditional land they are on. Every parish in the diocese has a mandate from me to reach out to the First Peoples, learn from them and build relationships with them. 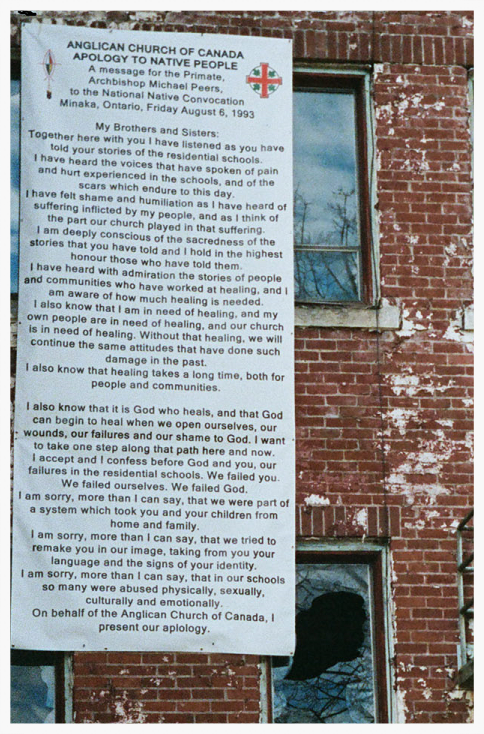 Some First Nations people have a profound strength that allows them to forgive and strive towards reconciliation. Where do you think they get that strength? The strength of First Nations people to forgive amazes me. The national Anglican Church has been working on reconciliation for a long time. We created a series of videos and one of the first was of the horrors of the residential schools and what that meant culturally, spiritually, loss of language and tradition. One survivor interviewed said “Jesus better come back again because the Church got it wrong so he needs to come back and tell them to do it right.” At the end of the video another man talked about the residential school and what had happened to him. He finished by saying “But I still love the church” – it gave me tingles up and down my spine. I asked myself if I had gone through what he had gone through, would I still love the Church? His statement about still loving the church made me recognize the profound strength and spirituality of First Nations people. And I think that profound strength comes from First Nations culture; they are grounded in their creation, their Creator, and being part of the land, sea and sky. The culture, tradition, the connection with the land that goes back generation after generation and the history that has formed them as a people - I believe that is where the ability to forgive and to work towards reconciliation comes from. If you found this article on Reconciliation and the BC Anglican Diocese interesting, please stay tuned because Bishop Logan is embarking on a “Sacred Journey” on Vancouver Island on March 7, 2016. Download our free terminology guidebook!